An adapted version of a talk given to Welsh academic librarians at the WHELF Gregynog Colloquium on 15 June 2015. The city of Kingston upon Hull is famous for its poets, among them Andrew Marvell in the seventeenth century, and Douglas Dunn and Philip Larkin in the twentieth. 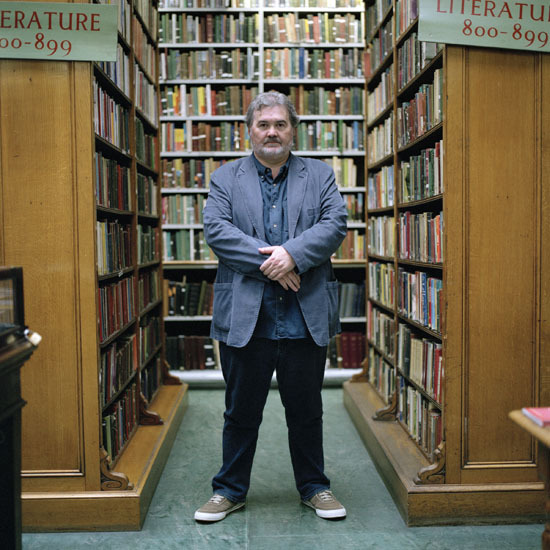 Hull’s best known contemporary poet is Sean O’Brien. His latest volume of poems is called The beautiful librarians (2015). Its title poem takes as its theme, strangely enough, beautiful librarians. At where I stood in adoration. It passes time that passes anyway. It’s a deceptively simple elegy, full of subtle detail and allusion: ‘the fairly recent graduates’, and ‘ice queens in their realms of gold’, with its echoes of Hans Christian Andersen and John Keats. One reason it appeals to me is that as a callow student I harboured similar unrequited adorations for the young female staff in the libraries I used daily. Not only are O’Brien’s librarians dead and gone, so too is their world, including their libraries (‘and all the brilliant stock was sold’). In his reading and his writing the poet may have remained true to his youthful vision and to the values the librarians stood for, but their world has irrevocably passed away. Was Sean O’Brien, I wonder, provoked to write his threnody by the recent loss of so many public libraries and their collections? I was asked to give this talk at the Gregynog Colloquium in the wake of the popular campaign in February 2015 to prevent Cardiff Council from closing almost half of its public library branches. 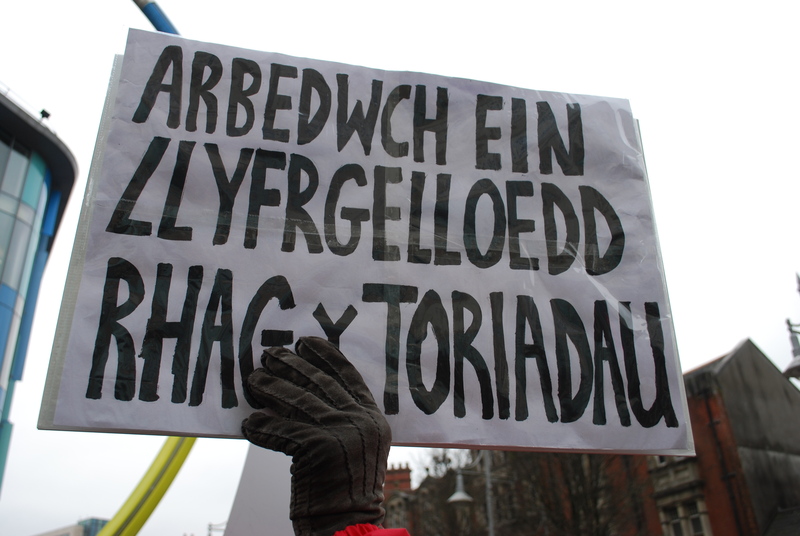 The Cardiff protest was successful, in the short term. The Council’s plan did not proceed. But I suspect it was a Pyrrhic victory. Roath, one branch library ‘saved’, may already be doomed, and others may follow, piecemeal – the usual way libraries close. the outsourcing of branches to volunteers or ‘the community’, with or without revenue funding. One distinguished public librarian I spoke to recently could name no instance of such a transfer successfully safeguarding a library service. the loss of new digital services, such as e-books, just as they’re taking off. A new, Orwellian vocabulary has arisen to disguise the significance of what’s happening. My favourite term is ‘vibrant community hub’, used to describe the co-location of the library service with other, wholly unrelated Council services, and to cover up the degrading and diminishing of the library element of the ‘hub’. Not vibrancy, but rigor mortis. The 1964 Public Libraries Act offers libraries and their users no protection. In Lincolnshire there was no intervention from the responsible government minister, even when the council wished to abolish most of their libraries (thirty branches were to be offloaded onto volunteers, only fifteen remaining). in Wales, half of the libraries in Rhondda Cynon Taf have already gone, and half of Gwynedd’s are planned to close. Could it be, though, that what we’re seeing, despite widespread protests, is not just assault or neglect from above, within central and local government, but erosion of public belief in the worth of public libraries? There was been a consistent decline in the use of public libraries (though attributable in part to contracting services). For their part, some public libraries have been slow to adapt – though in their defence, you could say that many are now so weakened that they lack the capacity to adapt. In Wales there are 22 public library services – far too many. In retrospect it would have been better to have created a national public library service years ago, at time of Rona Aldrich’s review. It may be too late now. Savings will be fewer, and some services are already ‘out of control’. The coming reorganisation of Welsh local government into a smaller number of authorities will make little difference. CyMAL is apparently working on new models for public libraries, but again, far too late in the day. 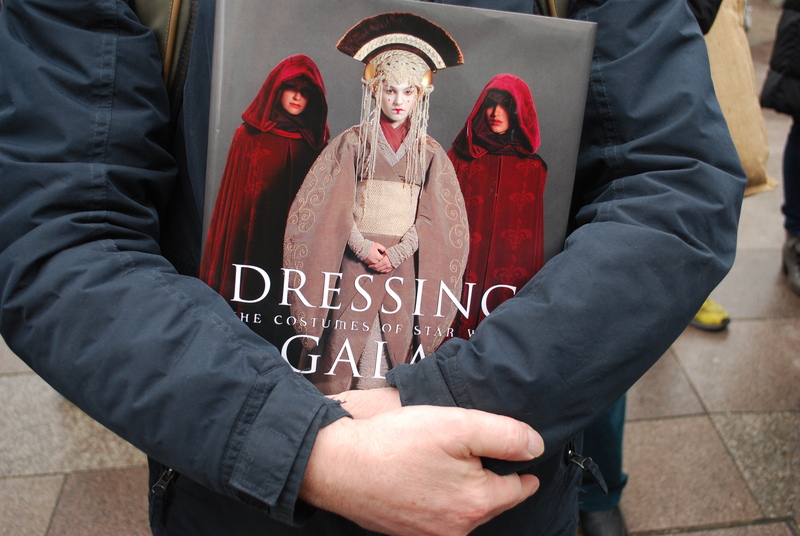 they allow people to explore their identities and backgrounds, through local studies collections and services. Home-educated and, by 17, writing for a living, the only alma mater I have ever had is Warstones Library, Pinfold Grove, Wolverhampton. A library in the middle of a community is a cross between an emergency exit, a life-raft and a festival. They are cathedrals of the mind; hospitals of the soul; theme parks of the imagination. On a cold, rainy island, they are the only sheltered public spaces where you are not a consumer, but a citizen instead. A human with a brain and a heart and a desire to be uplifted, rather than a customer with a credit card and an inchoate “need” for “stuff”. A mall – the shops – are places where your money makes the wealthier wealthy. But a library is where the wealthy’s taxes pay for you to become a little more extraordinary instead. A satisfying reversal. A balancing of the power. This and other testimonies are powerful, but it’s also possible, I’d suggest, to build a case for the continued relevance of public libraries not from empirical evidence by from rights-based principles. In fact, this kind of exercise is essential if we want to know what our libraries are really ‘for’. I concede that rights are unfashionable in some quarters. 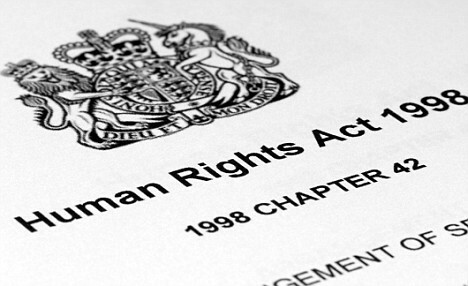 The current Westminster government wants to abolish the Human Rights Act. Some of its supporters wish to withdraw the UK from the European Convention on Human Rights. Others who are by no means reactionary also argue that a rights basis is out of date. David McMenemy of Strathclyde University recently proposed at the CILIP Wales Conference that we should turn to an Aristotelian set of principles based on the ‘promotion of virtue’ and ‘communitarianism’. But this approach has its limits. For one thing, its arguments can just as easily be used by our opponents to justify a ‘Big Society’ attack on public libraries. I believe a rights approach remains the only secure foundation for defending public libraries. So here are three right-based propositions. I apologise if they seem obvious to you, but sometimes it’s no bad thing to restate the obvious. Being knowledgeable is essential to be an engaged and informed citizen, to play a full role in society and politics. As the librarian’s friend Francis Bacon said, ‘knowledge is power’. If you doubt this, consider how many millions of votes were cast in the General Election in favour of UKIP, a party almost entirely reliant for its success on the existence of ignorance on a frightening scale. Being knowledgeable is, unsurprisingly, essential to being an educated person, another way of saying learning to be of use to your fellow-humans. It’s also central to self-realisation, that is, finding and making the most of your aptitudes and talents. You might go further still and argue with Socrates, at least according to the early dialogues of Plato, that knowledge is essential to an ethical, well-led life. For Socrates knowledge and virtue (goodness) are one and the same: no sane person would choose to do ill if he or she really knew its consequences to themselves. It’s true that a right to knowledge doesn’t feature in the Human Rights Act or the Universal Declaration of Human Rights. There is, though, a right to education – compulsory education for children is based on this principle – and behind education lies knowledge. To be denied the chance to gain knowledge is to be denied part of your human nature and your ability to function fully in your society. Librarians and many others have always fought against the denial of the right to knowledge, namely censorship. 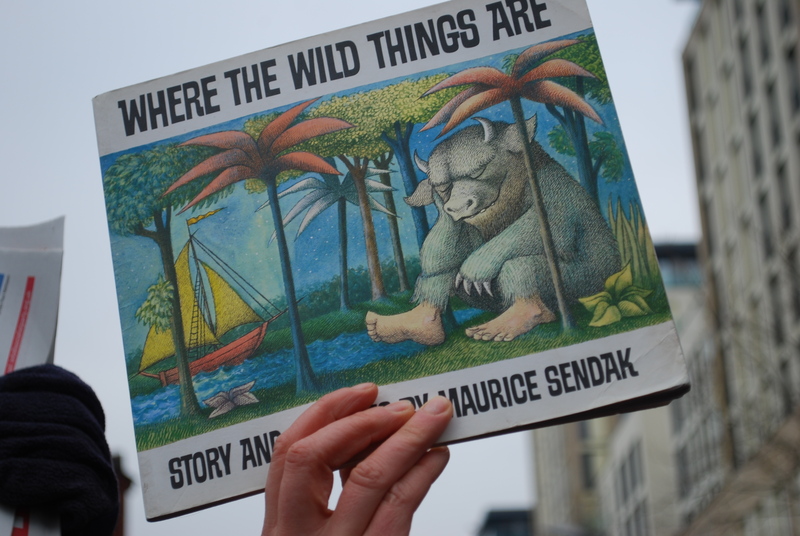 To take one recent example, Chris Grayling, the former Justice Secretary, tried to ban prisoners from receiving books until protests led to him being overruled by a judge in December last year. If knowledge is a right for all, it follows that everyone should have access to it – that it should be freely available. ‘Freely’ generally includes ‘at no charge’ at the point of use, since payment is a common barrier to availability, especially in a society like ours that is becoming ever more unequal in wealth and income. An example in the academic world is open access academic publishing, which relies on the principle that the product of knowledge paid for by the public should be freely available to it. Libraries, above all other institutions, are still the leading provider – or mediator or broker or guarantor – of the free availability of knowledge. The main method they use is a collective approach to provision: pooling and then sharing resources, whether print collections or centralised online subscriptions or others, among a large number of people. Now I have to acknowledge that there are ways of avoiding subscribing to these or any similar principles. Especially in academic or business-based libraries, it’s possible to take an exclusively instrumental view of a librarian’s task. Library work, on this view, is an ancilliary or auxiliary activity, defined exclusively by the fulfilment of the tasks required of it by the needs of the institution’s leadership, for example, teaching and learning. The values of the library, in other words, are identical to those of its parent, and no others are relevant. 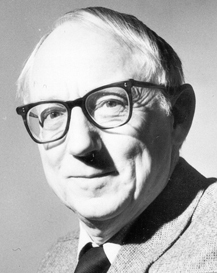 When I was learning to be a librarian, a long time ago, there was a luminary called Douglas Foskett, mysteriously famous for an article he published in 1962 and neatly summarised by its title ‘The creed of a librarian: no politics, no religion, no morals’. I thought the man was misguided at the time, and across the distance of over 40 years his thesis seems even crazier. For one thing, if you’re a CILIP member you’ve signed up to a code of professional ethics, which does seem to involve owning and displaying moral behaviour. My view is that are distinctive professional values that lie beyond espousing a set of changing techniques. These are universal values. They transcend the context or environment within which an individual librarian chooses to practice. If you’re persuaded by my argument, it follows that as academic librarians you should be concerned about what is now happening, and what is going to happen, to public libraries. 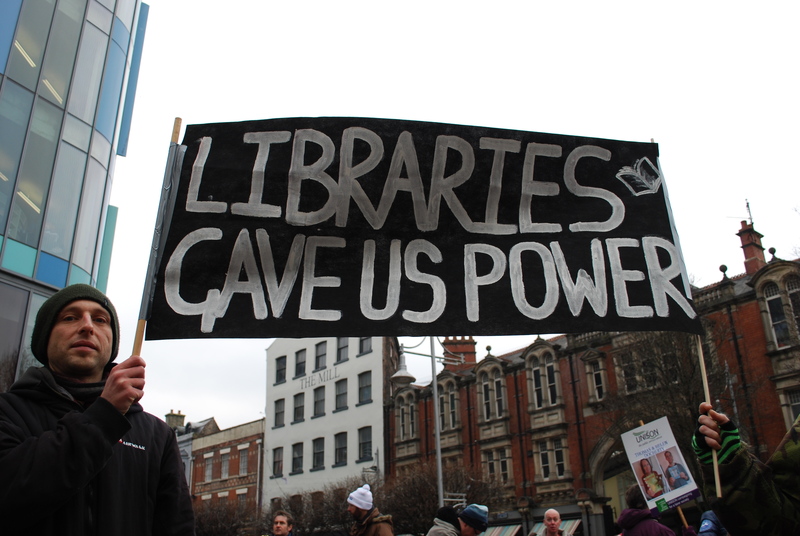 What should you do as an individual academic librarian, or collectively as an academic library, to react to the current situation – which can only get worse following the general election and the redoubling of public sector austerity? Here are some suggestions. First – and I suggest this with some hesitation – work within your profession. Be active in your professional body, CILIP, side by side with public librarians; support them and give them aid. I say ‘with some hesitation’ for two reasons, because membership of CILIP is low among academic librarians, and because CILIP nationally can appear supine in the face of the extinction of library services. Nevertheless, CILIP does offer the structure and environment for local support. Second, become active yourself. On the way to Gregynog from Swansea I came through Newbridge-on-Wye, and in the window of the old Commercial Hotel I noticed a reproduction of an illustrated heading for the Socialist League, designed by Walter Crane for William Morris in around 1885. Its wording reads ‘Educate. Organise. Agitate.’ Good advice for librarians, 120 years on. Write to your Council, MP or the press. Join a local protest group or Friends organisation. Join the Library Campaign, or Voices for the Library, which both share information and advocate, sometimes fiercely. Tweet. Exploit Facebook. Use your professional knowledge. Persuade your friends to do the same (external advocates count even more than you do). Don’t underestimate the impact of an informed voice. Third, let the public in. To your library. Wales has a long and honourable record on public access by academic libraries, both individually and collectively, for example through local consortia like Libraries Together, CLIC and Linc y Gogledd. WHELF’s Walk-in access Wales has experimented with public access to electronic information services. But ask yourself how well used are these schemes. I suspect they are not that well used. How could you encourage more take-up? Be more proactive. But what if, despite all attempts to save them, public libraries wither and die? Academic libraries may them be left as the only publicly-funded libraries in existence (I make a questionable assumption here that universities still belong to the public sector). In this case academic librarians, I suggest, may need to start thinking about more radical measures. Now I recognise that your current environment may not seem conducive to radical thinking. Contemporary universities tend to act more and more as commercial businesses. Considerations of profit and self-interest are dominant in the minds of those who lead them. There seems to be a widespread withdrawal from community third mission and engagement activity, evident in the rapid decline in the work of continuing education departments, and a loosening of the bonds with the local communities from which universities sprang. So, what can academic libraries do if public libraries are in fatal crisis? Probably the most critical area is printed and archival collections. Public libraries hold valuable local and distinctive collections – books, archives, photographs, maps and much else – that should be preserved. Often the libraries themselves are unaware of what they have – they now employ very few local studies experts. There’s been a renewed emphasis on the value of this material, in an age when ‘common’ library material is commoner than ever before, because it’s digital and widely available online. (A good start is Research Libraries UK’s 2015 report, Unique and distinctive collections: opportunities for research libraries). Could university libraries offer these collections a secure home and – a more serious role still – take over some of the ‘research’ functions of the public library? There are good precedents for this kind of ‘rescue librarianship’ within Wales. On two separate occasions the Library of Cardiff University has given sanctuary to important historic print collections – essentially the legacy of John Ballinger and his colleagues – in Cardiff Central Library. Thanks to the vision and swift action of Hywel Francis in the 1970s Swansea University Library houses many of the collections once held by Miners’ Institutes throughout the south Wales coalfield. It looks as though similar operations will be needed in future if Wales is not to lose numerous local and special collections located in its public libraries. In the past it was possible to consider buildings and even services operated jointly by local authorities and academic libraries – The Hive in Worcester comes to mind – and it might still be practical to achieve similar unions or partnerships where the local authority service has not been too weakened: a good case is Swansea, where discussions are now under way on the possibility of a joint public/academic archive. A second area where academic libraries could make a crucial difference to public library services is electronic information. As academic librarians you’ve been active in this field for decades already. Your libraries, and the bodies like Jisc that act for them, have developed plenty of experience in the technical and organisational skills of how to ensure an effective and cost-effective service. Public libraries, on the other hand, are only now beginning to get beyond the toe-dipping stage, for example in providing e-books and e-journals online. Their tentative and essential moves in this direction are now at risk from further funding cuts. So what can you do? First, and least painful, you should always press for open access, not HE-only access, when negotiating with publishers or aggregators. Press Jisc to do the same, as I remember doing in the case of its former digitatisation programme. Second, offer your expertise and help, not just to your local public libraries, but to public libraries throughout Wales. Think big. In the US Robert Darnton and his colleagues have inaugurated the Digital Public Library of America, an attempt to construct a nationwide online public library – this in a country where, remember, it’s generally taken for granted that whatever is private is sanctified, and what is collective and public is weak and poorly regarded. If the US can find a way, why can’t Wales succeed in building, on existing, small-scale foundations, a large-scale Online Free Public Library? If it can, the contribution academic libraries and librarians could make will be critical. Those are just a few ideas. You may have many more. What’s important, I suggest, is that you think about the future of public libraries in Wales, about whether you feel you have a responsibility towards them, and if so about whether you and your institutions can make a difference. What’s certain is that, unless people who care, including professional librarians, intervene to come to their aid, the beautiful librarians in public libraries, if current trends continue, really will disappear, along with their brilliant collections. Such an important statement…I hope it will be widely shared. Librarians, man!!! Librarians are cool. The rest of you? Be more like librarians. I agree that radical thinking is required and believe we, as librarians, must break down the artificial walls between the so called types – academic, public, special. In the digital world these walls cease to matter to our communities. Together we will be stronger and also not only provide access to a wider volume of knowledge but will hopefully help communities to come closer to wisdom. Burn the walls down. Hi Jane. Not surprised to see you comment on here. I agree, the breaking down of the silos is necessary. We here in New Zealand have seen continued separation between the various parts of the profession and I think that leaves us weaker overall. The plight of the public library is not divorced from that of academic ones, in fact I would argue a world without the public library sets the stage perfectly for the decline of the academic one as well. A stronger future is a cradle to grave approach of access to information, knowledge and experience and it is crucial that we start to paint the picture of this ecosystem. 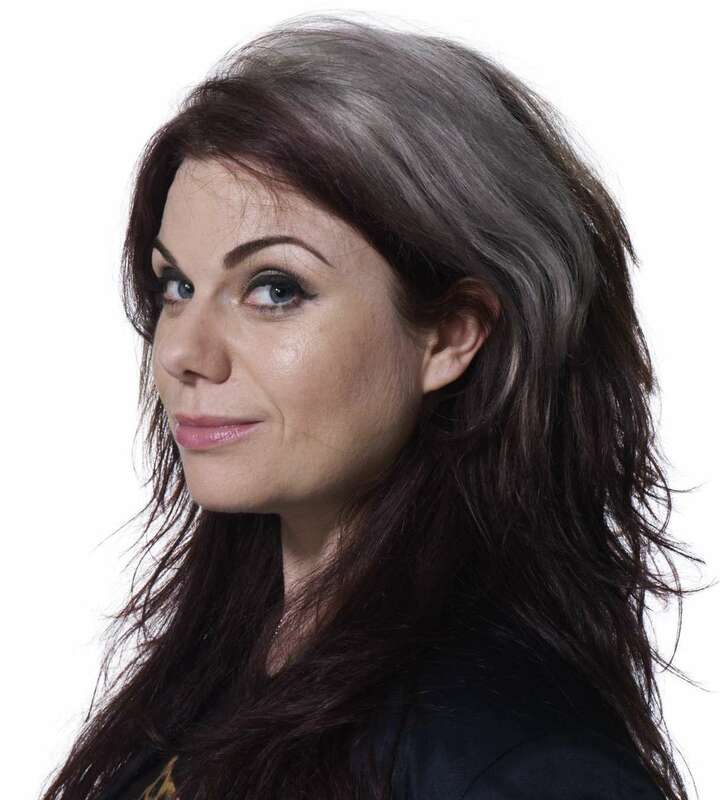 Diolch, Marianne. Hope all is well with you, and all in the Dept.